Tonight's question .... Advantages of ZVHT over CVHT, And Zetec Turbo over ZVHT?? Currently have no bottom end, so was thinking could possibly go ZVH, but want to know advantages/disadvantages. And what's needed to suit. 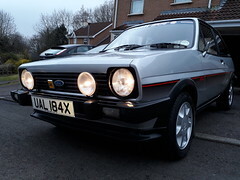 Likewise, I have seen a cheap 1800 zetec engine modified for turbo, so was considering picking that up and potentially running zetec turbo using FRST management. But unsure what this entails. It could pick up the zetec engine and run my fiesta rs head etc on top. Or should I just keep it simple and run 1600 cvh bottom end and maybe upgrade at a later date?? Just looking at options at the moment, need to decide soon. intrusive, but a cvh can yield good power for little money, a zvh will cost a fraction more than a cvh and give loads more torque/power, but can be less rev happy due to flow through head unless you do a lot of work. a zetec turbo is best for power, but dig much deeper into your pocket to do it right to yield enough gains over the other two options to make it worth doing. cvh for less than 250bhp, zvh for less than 350bhp, zetec turbo for upto 600bhp. Depends on what sort of engine characteristics you want. All will give really good power for a Mk1/2. Gotta be honest my Zetec Turbo feels torquey as hell! the zetec turbo with 2BAR of boost through a gt3071r is amazing!!! literally couldn't get enough grip though, you'd be 2krpm, 3krpm, then on limiter at 7600rpm with wastegate screaming! absolutely loved the engine, but you'd really have to go to town on geometry and moving weight over the front.